Note The real advantage of this type of cell referencing will be apparent when I discuss variables and looping (see Chapter 8). In most cases, you don't use actual values for the arguments; rather, you use variables. Think of the preceding example as though it said this: "Start with the active cell and consider this cell as cell A1. Place 5 in the cell in the second row and the first column." The second syntax of the Cells method uses a single argument that can range from 1 to 17,179,869,184. This number is equal to the number of cells in an Excel 2007 worksheet. The cells are numbered starting from A1 and continuing right and then down to the next row. The 16,384th cell is XFD1; the 16,385th is A2. The third syntax for the Cells property simply returns all cells on the referenced worksheet. Unlike the other two syntaxes, in this one, the return data is not a single cell. This example uses the ClearContents method on the range returned by using the Cells property on the active worksheet. How to use cells propery in excel vba? 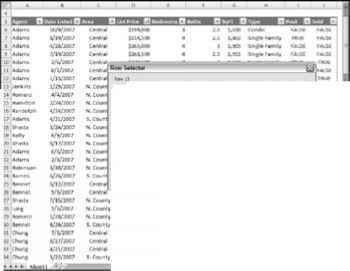 How to use cells in vba excel 2007?